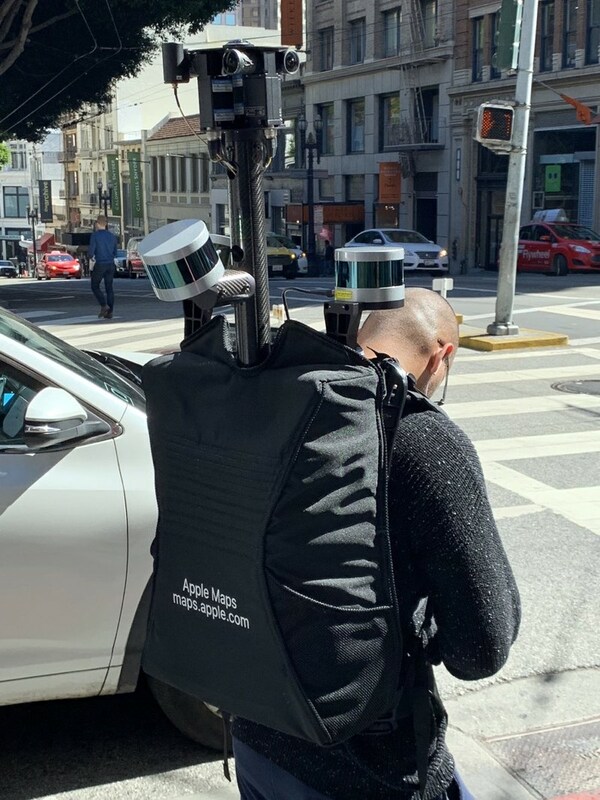 Last month, a person wearing an Apple Maps backpack with LiDAR equipment was spotted at the intersection of Stockton and Sutter streets in San Francisco, suggesting Apple now has employees collecting street-level data on foot. Apple has since confirmed that its Maps team will be collecting pedestrian data in California over the next month, starting with the counties of Alameda, Los Angeles, San Francisco, San Mateo, Santa Cruz, and Santa Clara, the last of which includes the likes of San Jose and Apple's hometown of Cupertino. 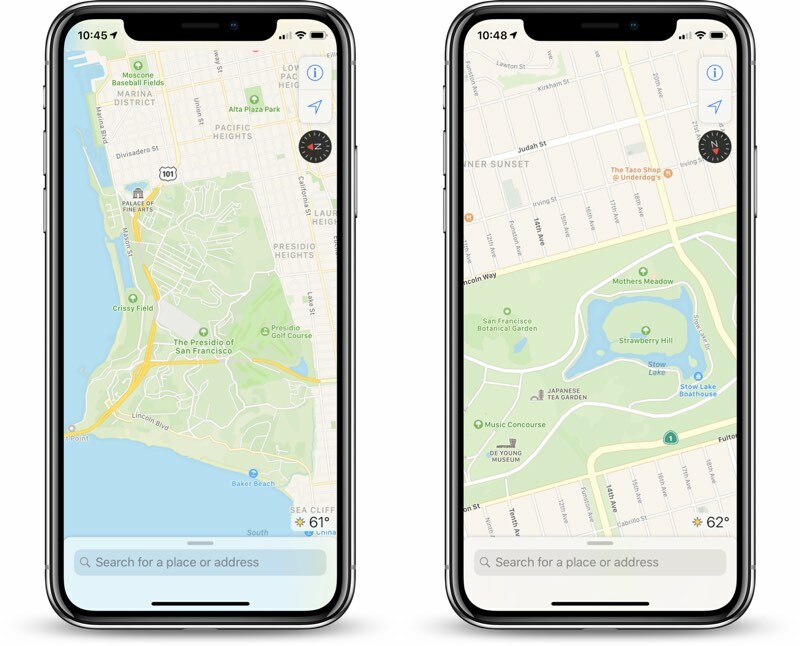 The pedestrian-based street-level data will likely be used to improve walking directions in Apple Maps, as part of Apple's plans to rebuild the app "from the ground up" with its own first-party data, starting in California. "We wanted to take this to the next level," said Apple Maps chief Eddy Cue, in an interview with TechCrunch in June. "We have been working on trying to create what we hope is going to be the best map app in the world, taking it to the next step. That is building all of our own map data from the ground up." As part of the revamp, Apple Maps will begin to feature pedestrian pathways that are commonly walked but previously unmapped. Apple Maps will also more accurately display foliage like grass and trees, buildings, parking lots, sports fields, and more, with many of these improvements already available in California in iOS 12. Apple said the improvements will extend across the United States over the next year, but there is no timeline for a broader rollout. The ball is rolling internationally, as Apple Maps vehicles have surveyed parts of Croatia, France, Ireland, Italy, Japan, Portugal, Slovenia, Spain, Sweden, and the United Kingdom. Hours before that photo was taken, the subject was trying to think of how to discretely test out their new jet pack. Then it hit them: pop an Apple Maps label on it. Are they going to indicate all the, uh... "debris"... on the sidewalks throughout San Francisco? That would be a fun job. Getting to walk all day would allow me to get my excericse in while getting paid. Why would they ever have "Apple Maps" printed so visibly on the bag? This poor guy must get stopped/photographed literally every minute during his runs. So people don’t mistake it for a bomb or a gun and call the police on the employee who respond by shooting him just to be safe. We have and edgy society and even edgier police force. This is a monumental task when you think about it. Objectively, Apple should just let google continue to do all the hard work for a maps application. The fact that Apple is spending so much resources on this is indicative of a deeper concern with competing with Google, and I'm wondering if/when Apple will announce their own web search engine. No Google please, I despise them, maybe crowdsourcing would be a better idea. That guy's going to be knackered by the time he's finished! Seems like a fit guy, and it seems like it's (gear) all made as light as possible, there's quite a bit of carbon fibre in that picture. No it isn't. Apple will just have this guy map the area near Tim's house, then put him back on the emoji team. This is a monumental task when you think about it. Objectively speaking they are being slow and opposite to the "monumental". They've done only the part of US, very small part. So the fact that they do not invest in Car-mapping cars to ALL 100 countries or more is just a weak game. We don't have transit maps in Poland, no speed limits, no 3D buildings, no buildings at all (even the flat one, just the shapes, only the capitol has them (flat ones)), and the maps are pretty much outdated. So maybe, it would be a good idea to send those cars out now, as this process takes time, and by the time they will convert Poland to their new format, it will take DECADES (no kidding, mark this post). But, at the same time, I'm pretty sure that France, German, will be available in their new and better format around 2022. So if they will appear around this time, one could and should and will ASK, why so late? It's not a battery technology, it's not an nm technology of Ax Chips. It's just a matter of business decisions. Since they are going to SHELL OUT money for UK/France/Germany maps anyway, why wait? Why not just throw money at it now? Make a big entrance, send those cars to 100+ countries, give them some time, map them good, and ok, release better maps of Poland in 2022, that's fine! But with the current state of the affairs, I don't see that happening in decades from now.